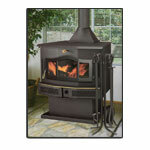 Bay 2000 freestanding wood stoves and are as versatile as they are reliable. Bay 2000 fireplace can add a classic source of heat to your family's favorite gathering place. The Bay 2000 fireplace is dedicated to heavy duty heating. Constructed of heavy steel and lined with 2000-degree firebrick, this fireplace is built to provide comfort and value with long life performance.